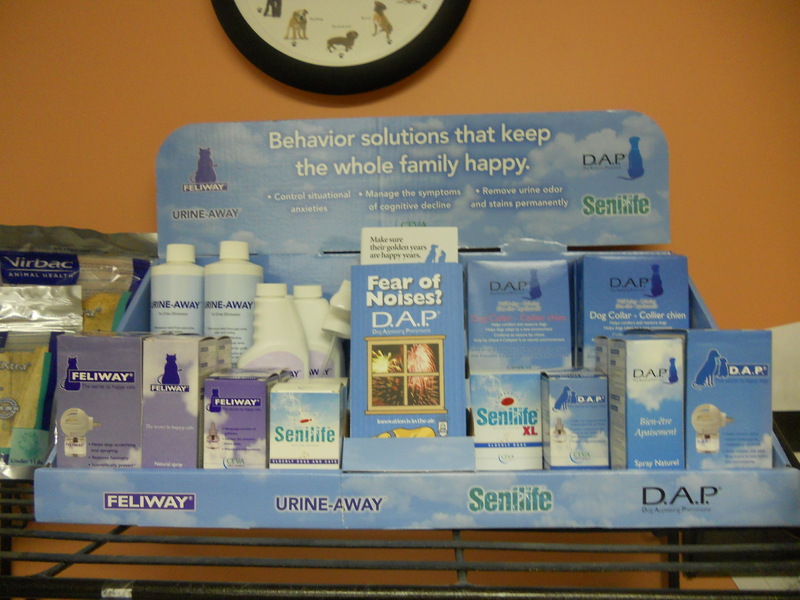 Products for urine marking, anxiety and declining cognitive function in dogs and cats. Holmes Veterinary Hospital now carries Ceva’s line of pet behavior solutions. DAP products help with anxieties such as noise phobias (thunderstorms, fireworks), separation anxiety, general anxiety and anxieties about travel, veterinary visits and boarding or grooming. DAP stands for Dog Appeasing Pheromone, a pheromone that calms anxious or nervous dogs. We carry the DAP Collars, which are like a flea collar. The DAP spray can be used in pet taxis to calm dogs during travel or can be sprayed on dog’s bandanas or clothing and even bedding. Also available are the DAP diffusers and refills for the diffusers. A diffuser treats about 750 square feet. 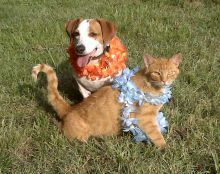 Feliway products are used to have a calming effect on cats. The spray can be put on areas to discourage urine marking. We also have the diffusers and refills. Feliway helps with urine marking behaviors, anxiety in multi-cat households as well as anxiety from travel, grooming, boarding, veterinary visits. It can be sprayed in pet taxis prior to travel to calm nervous kitties. Urine Away comes in a soaker bottle and spray. It breaks down odor from pet urine so that it cannot be detected by people or pets. We also have Seni-Care oral capsules that help with declining cognitive function in senior dogs. Senior dogs with cognitive dysfunction have been compared to people with Alzheimer’s disease. They may become confused easily, get lost in the house or yard, seem to wander or pace aimlessly, vocalize more or get their days and nights mixed up. For more information, give us a call at (864) 984-2365. ← Poll: Are you a “dog person” or a “cat person”?